An excellent choice for individuals or small clubs, the AT-250 clay target thrower is a commercial-grade trap at the most affordable price. A fully automatic, 250 target trap that features a dual-articulating roller setup to feed different brands of standard size clays without having to stop and readjust the feeding mechanism. 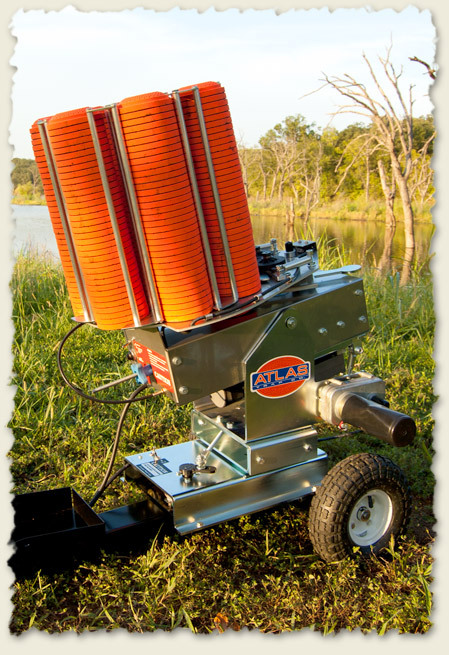 Its light weight and portability make it easy to rearrange your sporting clays course. The AT-250 wobble trap comes with a 100’ push button release cord, a control panel integrated into the rear panel of the trap, and a 5-year limited warranty. Just received last week and tried it out on Sunday. Shot 800 Walmart style clay targets and only had one that broke. Machine operated flawlessly out of the box with no adjustments. The trap seems very well built, we shall see over time. I anticipate we will put upwards of 20,000 clay targets through it this year. The customer service is excellent when I asked for more information they sent me a link to a video that showed me everything I needed. It would be nice to have a link on their website that directed you to informational videos. After much thought and homework, I purchased the AT-250 Wobble (with the commercial cart). After numerous calls between Mike, Scott and myself, I realized that this was the thrower that fit my needs best! After some minimal assembly it was ready to use. We threw 200 birds on the first day and the thrower performed flawlessly! No broken targets, no adjustments! Just like they advertise! The machine is all that I expected and more. It is extremely powerful and will test even the most accomplished shooter. I am totally and completely satisfied with the thrower. It is worthy of what I payed for it. Next comes the support and customer service! Second to none!! Mike and Scott bent over backwards for me with all the questions that I asked. They always had time to talk and answer my inquiries. The thrower, cart and cover all exceeded my expectations! Atlas is a great company and I will not hesitate to do business with them again! Saved up for quite a long while for this trap. When I got it and set it up I was very impressed with its build quality and function. Had one minor problem with the remote cord but thanks to Atlas and their awesome customer service, I had a new one in just a day or two. I highly recommend this company and their products and will likely buy from them again in the future. The AT 250 with wobble base has worked flawlessly and is as well desinged at the AT 50 I purchased 12 years ago that we still use. Just as impressive is the service that Atlas provides. I will continue to its customers. Got the At-250 with wobble kit. Work like a champ right off the pallet. This is the real deal. Easy enough for my 10 year son to operate (with adult supervision) yet still operates like a commercial unit. A group of 10 of us recently purchased 25 acres of land. None of had ever bought trap machines before, but were committed to finding reliable machines that would give us hours of fun. Well, we found that in Atlas Traps! We've only purchased the Wobble for now since we have some land to clear, but we will be purchasing at least 5 more machines to give us a small 5 stand course. Thank you Mike for ALL of your help and guidance. You made the process very easy! I purchased the At250 and the AT50 right at X-MAS time and have had them out twice with my employees. One of the best things I have ever done to boost morale with my guys. After both shoots that all they talked about. Quality of this machine is second to none in my eyes. No broken birds, no miss fires, and always sends a bird out. 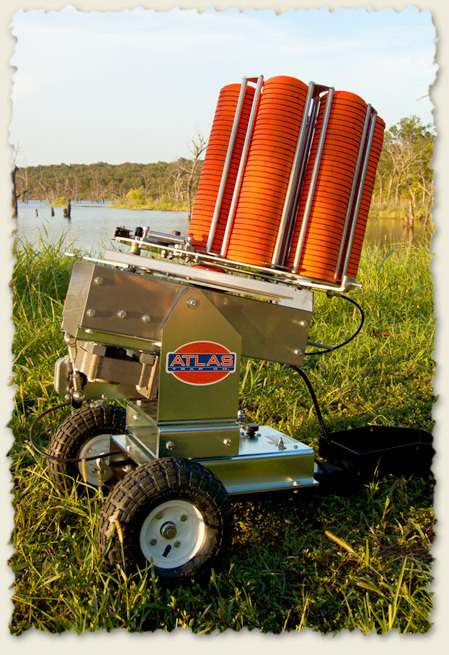 If you are looking for a thrower I would buy a ATLAS!!!! We purchased this Wobble ATA-250 Trap Machine about a month ago. It looks as good as advertised and works flawlessly. We mounted the Trap on a sheet of 3/4" plywood and installed it in the bed of a EZ-GO Workhorse dump bed. We included a Large 12v Deep Cycle Battery to power the unit. We also installed a main on/off switch on the cover of the battery box. This is a great way to go. Then you can drive the cart to wherever you want to shoot, and not drag a trailer behind you! This Trap performed flawlessly and we would buy another when we need one! Way to go Atlas!